NASA sent two people to walk on the moon in 1969, when the entire agency possessed less computing power than your mobile phone. We can do better! It will take time, but once security concerns are mitigated, the benefits of online voting become clear. The increased convenience that people would experience from voting through their own devices, and from home or work, would likely result in significantly higher voter turnout. Absentee ballots would be a rare occurrence and people with physical disabilities would have an easier time participating in elections. Another benefit is cost efficiency. In 2009, the city of Honolulu saved around $100,000 on a municipal election by implementing online voting. The cost reductions were attributed to the removal of expenses associated with ballot counting, and the postage that was previously used in a mail-based system. While online voting is a reality in smaller corners of the country, and in countries with smaller populations, like Estonia and Ukraine, it will take time and effort to upscale such a system for usage at the national level. But let’s suspend disbelief, and rethink what the user experience of online voting could look like if the obstacles preventing its widespread usage were overcome. From the perspective of a design and strategy consultant for Cooper, here are some design considerations our voting officials may wish to consider as online voting evolves. It’s not enough for the system alone to be secure and anonymous, the user must also be confident they are casting a nameless vote that is protected from manipulation. When Estonia had its first online election in 2007, it created an easy-to-understand, two-minute instructional video, which explained the security process behind each user’s vote. The dynamic design opportunities that online voting can offer will have significant advantages over the traditional, non-electronic systems. However, with great power comes great responsibility. If we are careless designers, we can create opportunities to unintentionally mislead voters. A sheet of paper is a fixed size. Therefore, it contains a finite number of candidates at a readable font size. 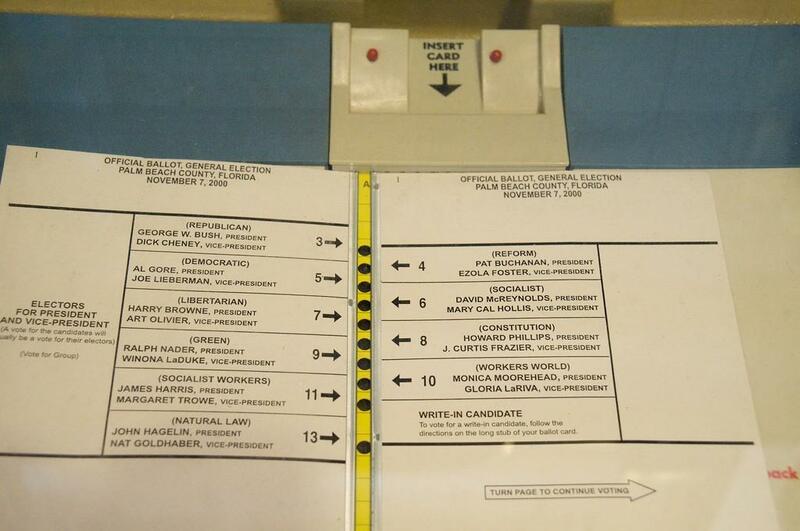 In order for a ballot designer to fit all of the candidates on one side of the paper, she might need to reduce the font size or spacing of the layout. This could lead to a crowded design or a font that’s too small for some voters to read. In contrast, a screen (such as the one found on a laptop computer) can contain a seemingly infinite number of candidates at any font size and spacing. However, the designer must be aware that users may not see all of the candidates if it is not obvious that they can scroll. The design on the left makes it clear how a user can submit a vote by placing the SUBMIT button inside of a fixed footer; if the user scrolls, the candidate list advances while the footer remains “fixed” in the same position. However, this convenience can become costly if a user fails to realize there are more candidates. A better solution, illustrated by the design on the right, is to place the SUBMIT button at the bottom of the list, which will force the user to see all of the candidates before they have an opportunity to submit their vote. It’s okay if a user takes a few extra seconds to figure out where the SUBMIT button is, but it’s completely unacceptable for her not to realize that there are more candidates. In addition to being able to scan a readable list of candidates, online voting ballots also provide designers the opportunity to make the selection state of options more pronounced. With current voting systems, a voter marking an “X” next to a candidate’s name on a paper ballot or flipping a lever on a mechanical based machine might be the only visual indications she has before committing to a vote. But with a digital interface, we have more options. Consider the illustrations below. The design on the left shows a perfectly adequate selection state, however, it doesn’t offer users much of an advantage over paper or lever ballot selections. The selection state in the design on the right is much more noticeable and will be easier for a user to find when they scan the page to double check their selection before voting. But we can add even more reinforcement by dynamically updating the SUBMIT button to include the candidate’s name. Using a traditional paper or lever-based voting system, a person must physically insert a piece of paper into a ballot box or physically pull a lever to submit a vote. There is an automated and clear confirmation that the vote has been submitted. By contrast, the only system requirement needed from someone voting online is the click or tap of an on-screen submit button. But people need more than that. It’s not enough to just click a button and wonder if your vote has been uploaded. They need that same satisfying confirmation that physical voting methods yield. Like online retailers and financial institutions have been providing for years, confirmation pages are necessary for voters to confirm that they voted properly. Oftentimes voters are quick to vote down the Republican or Democrat party line on election day. Two reasons for this: pressure at polling stations to keep long lines moving, and widespread apathy. Although not as commonly practiced as it was 50 years ago, in states that permit straight ticket ballots, lazy voting is further encouraged by providing an option on the ballot to vote for all members of a particular party. With online voting, that pressure would be eliminated. A voter would be able to cast a vote within a number of days instead of hours. In Estonian elections for example, voters have seven days to cast their vote online and they can even change their choice within that timeframe. With such a large window to cast a vote, there is an opportunity to provide education about government that doesn’t currently exist at polling places. Local elections will often have a bigger impact on our lives than a presidential election and voters need to know this. For example, what is a comptroller and why should you care? Voting websites could provide immediate access to that kind of information, which could lead to more informed decisions and less partisan voting. No one votes because they think a single vote can change the outcome of an election. People who vote do so because they are fulfilling a civic obligation. Online voting has the potential to provide convenience and save us time, but voter turnout can be negatively affected if the social aspects that traditional voting offers are not considered. Switzerland had attempted to combat decreasing voter participation by implementing a vote-by-mail system. They assumed that by reducing the time it took for people to vote, they would help increase voter turnout. The strategy backfired and turnout actually declined in areas where vote-by-mail was launched. Patricia Funk, an economist who wrote a paper on the role of social norms in voting, theorized that social pressure, rather than economics incentives (such as time savings), was the motivating factor behind getting uncommitted voters to the polling stations. Switzerland, in their attempt to save people time through vote-by-mail, had unknowingly removed this social pressure and as a result, reduced voter turnout. If we are to adopt a system, such as online voting, that physically isolates voters from the community, then we must replace that loss of community with something that can produce a similar sense of social cohesion, civic responsibility and inclusion.For instance, at the end of an online voting process, there could be an option for voters to share that they just voted across social media. It would be the online equivalent of the “I voted” sticker. According to a Techcrunch article, Facebook had success boosting voter turnout in the 2012 election when they promoted an “I’m Voting” button above the newsfeed. This article intends to provide a starting place to contemplate considerations as we design online voting systems. The design examples appearing in this article are intentionally simplified because the needs of voters in an online voting environment have yet to be thoroughly researched and realized. Many government websites offer mediocre user experiences, and little benefit over paper forms and processes. My hope is for designers and policymakers to meet heads and start thinking and discussing a modern and engaging future of voting that serves citizens and democracy. Photo Courtesy of Sutterstock "Voting Online"
Sadly, there are many problems with online voting which have not been covered by the author. Security is a major issue as it is almost a daily occurance to read about some government or corporation's web site or private database being hacked. Ransomware, viruses, trojans, STUXNET, etc. If online voting truly is inevitable, then it is also inevitable that it will be hacked! Or rigged! Because we have yet to have a system that can't be hacked, and if banks, with all their money, can't keep hackers from stealing millions of dollars from their online systems, it's extremely unlikely online voting systems will be able to prevent hackers from changing votes. And, with online voting there is no means to properly audit the election. There's no paper trail to follow. Ones and zeros inside a computer are easy to change without being tracked, especially by someone on the inside. Can we trust the online voting company, or someone working for them, wasn't paid A LOT of money to change the results? How much money is poured into election campaigns by corporations? Voters need to know their vote will be secure & anonymous, but if the recent hack on Russia's online voting system prove anything, it's the fact that who a person votes for is being recorded! Don't we also need to ensure the one person, one vote principle? If bots can be programmed to spam e-mail the masses or buy up all the tickets to a concert, how do we know they can't/won't be programmed to change numerous online votes? I don't care how friendly the user interface is, with online voting there is nothing, not a damn thing, to prove that my vote was recorded exactly the way I cast. Anything could have changed it! The system can give me all the validation it wants, from printed receipts to voter verification, it doesn't mean the vote counting isn't somehow rigged! From technical glitches, to deliberate acts. There's no proof at all. Period. It is always good to promote civic engagement, but online voting has not been proven to raise voter turnout. In fact, the statistics in the numerous municipalities in Canada where online voting has been used the most have proven this. I know when I place my paper ballot in the box there is nothing linking me to my vote. I also know that if the election is called into question independent auditors can count and recount my ballot and it won't have changed. I know that hackers in any country didn't change my ballot. I know this. I trust this. This is why we should stay with paper ballots! Exactly. I couldn't have said it any better.